Ron McLeod, past president of HTCIA Atlantic, wants parents to attend the upcoming cyber safety event and offers advice like keeping a post-it note over a computer’s webcam incase it’s remotely accessed, the webcam will be visibly blocked. Leading internet security experts are meeting in Halifax and offering parents a free education session on cyber safety and cyber bullying. “It’s especially important for parents of junior high level children to educate themselves because they’re being exposed to a lot more vulnerable applications and peer pressure to fit in,” says Blair MacLellan, president of HTCIA Atlantic Canada and a member of the RCMP tech crime unit Nova Scotia. High Technology Crime Investigation Association (HTCIA) is an international organization hosting it’s regional conference in Halifax on Sept. 18 and 19 at the Marriott Harbourfront Hotel. The Atlantic Canada Chapter was recognized as International Chapter of the Year earlier this month, partly due to their public outreach and education, says Ron McLeod, past president of HTCIA Atlantic Canada and local internet security specialist. “The threats that exist online to ourselves and our families are evolving everyday. Our children are living their lives inside an online virtual environment largely devoid of responsible adult influence. And it’s “Lord of the Flies” in there all the time,” says McLeod. Clickjacking, SnapChat and details of free info night: Click for the complete story and internet safety tips. “We’re tracking through our platform 500-to-600 posts per day where kids are either saying or showing things of extreme concern or showing very, very poor judgment,” says Darren McLeod, VP and Director of Sales at Social LifeRaft. The free parent and child (12+ years) evening is Sept. 18 from 6:30 to 8:30 p.m. at the Marriott Harbourfront Hotel, 1919 Upper Water St., Halifax. Anyone can register for the two day conference, featuring presentations by Symantec, a leading online security company and conference sponsor, along with presentations from other world experts in cyber safety. Information available at www.atlantichtcia.org. It’s one for the calendar, if you’ve tech-savvy children or children on the cusp of the online world, check out the 2014 HTCIA Atlantic Canada IT Security Conference on Sept. 18 and 19. As part of the conference, High Technology Crime Investigation Association Atlantic (HTCIA) are offering parents and children age 12 and older, a free information evening on Sept. 18 from 6:30 to 8:30 p.m. at the Marriott Harbourfront Hotel in Halifax. Their mandate: to educate families and children about internet security and inform about online vulnerabilities affecting local students, tween and teens. Conference info and registration available on HTCIA website. No registration necessary for the free parent & child session. Don’t share personal information such as home address, telephone numbers or parent’s work address online as cybercriminals can use this information to create a fake profile with your details. Don’t post holiday plans as criminals have been known to track people’s movements. Keep all passwords safe and private, however sharing with parents is a sensible idea and don’t use an easy password like a pet’s name. Don’t talk to strangers online or offline – Blair MacLellan, President of High Technology Crime Investigation Assoc. (HTCIA) says the online world shouldn’t be any different than the real world and wants children to be aware that online strangers aren’t always who they say they are. Let parents know if a stranger has tried to connect online. Make sure mobile phone is pin-protected and download a security app which allows you to remotely wipe any personal data, should your mobile be lost or stolen. MacLellan recommends ‘Find my Iphone’ for Apple devices and ‘Android Lost’ for Androids. Keep security software up-to-date on all devices including mobile phones, tablets and PCs. Click for a complete list of Symantec Safe Surfing Tips. Should you consider buying your kid’s domain name? Think of it as an investment in their future, their name, their brand. After an online incident that happened this week, I’m glad I did. Not everyone will agree. 66% of people polled in this article from 2010, felt it was absurd to reserve their childs Facebook or twitter name. On Twitter it’s unlikely they’ll ever actually use their real name, so I agree some platforms aren’t as protective as others. The other day I received a comment on my website from my brother-in-law in Ireland. It came from an email with his name built into it, for pig iron, let’s say the email was: info@johndoe.ie. I moderated the comment approved, linking it to my website. No harm done. The next day, my husband who is a Realtor, received a bizarre request through his website, from a potential home buyer. He flagged the name was an alias he remembered a former troubled classmate had used, a classmate prone to distasteful pranks and cranks, more than 20 years ago. The email attached behind the prank inquiry was the same email: info@johndoe.ie. His brother? Knowing his brother isn’t one to email a prank message, we deduced the prankster had bought his brother’s domain name: www.johndoe.ie and now had access to the email: info@johndoe.ie. This empowers the prankster to email any of John Doe’s friends, business contacts, family members, etc., and engage in a false conversation. It’s scary. If the prankster wants he can also build a free website in John Doe’s name. For as little as $9.99/year, I hasten to imagine my child’s domain name in the hands of a bully, former boyfriend or disgruntled school mate. But posting on people’s walls and hacking emails is as regular in high school today, as writing on the bathroom wall 20 years ago. This prankster first targeted my husband’s brother many moons ago. He repeatedly prank called John Doe and John Doe reacted, fuelling the bully for continued targeting. This went on for a time before fizzing out — 20 years ago his tools were a series of phone calls and crude drawings. We now live in Canada, have nothing to do with this person, and yet he felt compelled to comment on my website using my brother-in-laws name and sent my husband a false inquiry. Some people have nothing better to do and cyberspace makes it simple for a bully to target you or your children. How and when to protect a name? Little Jane Doe is born and there isn’t anything you wouldn’t do to protect her. One way to do this in the online world, where tweens and teens are easily targeted, is reserving www.janedoe.com or www.janedoe.ca. But I didn’t do this when they were born. I did it when they were approaching middle school age and the age where they could be potentially maligned by someone in their peer group. Someone, not old enough to recognize the consequences of online nastiness and skullduggery. By doing this, you reserve and effectively protect the child from someone; a stranger, a classmate, a potential bully, from getting entire control of their name. It took less than five minutes to buy the domain names on a site like GoDaddy. I won’t use them for anything. If searched, they will remain a blank canvas for the girls to use, when they’re older. While my girls haven’t begun to think about the future thumb-print they will leave in cyberspace, I feel secure knowing when the time comes, they’ll have some control of how their name appears in a search engine. For more advice regarding online safety for kids, send me an email. Reserving your child’s domain name couldn’t be easier. It can protect them in years ahead, as they navigate the murky cyberspace of their tween and teen years. Find a domain registrar you trust. We like GoDaddy. But there’s NameCheap and Name.com or domainmonster, to name a few. Most registrars will ask if you’re interested in several add-ons. They’re not necessary if you’re simply reserving the name for future. Canadian? I’d recommend .com and .ca. They’re the most commonly searched, but the value is really in the .com’s. Some registrars offer a discount for multi-name buys. Purchase before middle school: To protect our children against potential peer bullying, we opted to reserve their names when they were about 11-years-old. This is generally the age they’re regularly using internet and it pre-dates middle school and high school, where tech-savvy kids have the means and know-how to effectively manipulate an online identity. Leave the domain blank. Don’t use your child’s name to post pictures and personal information. It’s potentially harmful and can open children to online predators. Keep it private = Keep it safe. This advice comes from me, a tech-savvy mom interested in protecting her kids online and sharing advice with parents, to help us all stay one step ahead. Take the advice or leave it. But stay safe! Who’s behind your kids Apps and shaping their charming faces? My 11-year-old daughter asked me for some new apps today. Thinking I’d be clever, I asked her to write down the names of the apps she has heard about from her friends and the names of the app developers. I told her I’d google the developers to see what kind of companies they were, what they were developing and try and navigate the murky waters of app developers who are targeting young children and tweens. I’m curious, what’s their motivation? Have you ever wondered what motivates a company to create a slew of FREE apps directed to young girls, encouraging them to take their picture, change their faces, modify their voices and share their creations? Do app developers then have access to their customers photos? How much information can be gleaned from the activity of children on the apps? Emails? Locations? 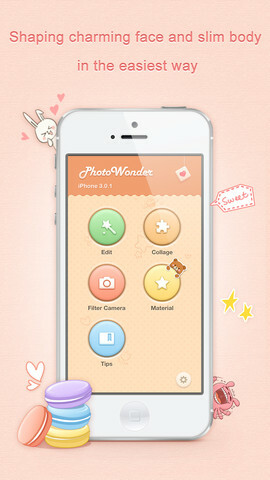 Photo Wonder by Developer: Beijing Baidu Netcome Science & Technology Co., Ltd. I love this app so much! It is not only cute but very useful! I recommend it to anyone who loves taking selfies! But don’t worry parents — it’s for ages 4+. But just because a four year old can use this app, is it ‘safe’ to teach young children that re-shaping and slimming is better? If the app then encourages users to share enhanced photographs of themselves, is that a safe online practice? I went to the Apple website to see how new app developers were regulated and what criteria did they need to meet to be able to give a 4+ guideline. I’m still looking. Parental App Review sites like Common Sense Media offer advice and age appropriate guidelines to parents, but it’s not comprehensive and Photo Wonder didn’t appear at the time this was published. And it’s not always what the app does, but tather, who the app exposes our children too. And perhaps I’m over-thinking this and all of these FREE Princess Apps, Make-up Salon Apps, Voice Changers, etc. are harmless. The question is, who can tell us and who can we trust? Little does she know, it’s not only unfair, it’s a mine field. What’s my motivation? I studied Journalism at University of King’s College in Halifax, NS and spent several years working in kids television at YTV, where I promoted, marketed and adhered to CRTC’s guidelines and regulations for ‘speaking’ to children through media. The rules there are clear, as are parents expectations. I’m simply trying to examine the disconnect that’s taking place in our children’s world online.